Feels like I was writing my 2014 Year in Review just last week. Astonishing how time flies when you are busy having fun. In the technology industry, if you are not learning you are dying. Having spent a lot of time in the Architecture space there is not much that frustrates more than Ivory Tower Architects. For me, I need to touch a technology to really understand it. Reading about it doesn’t give me enough insight to set direction for its usage in a company. In 2015, one of my goals was to really dive into API Management platforms and more specifically Azure API Management. I started hearing about API Management platforms when I was working at Mulesoft. While I never had any engagements that required their APIM platform, I knew enough about it to know that API Management, as a domain, will be big. When trying to balance work and speaking opportunities/obligations, I try to ‘kill two birds with one stone’. As you will find in the next section of this blog, I had the opportunity to speak about Azure API Management on several occasions. It was signing up for these sessions that motivated me to do a good job researching the technology. Probably one of the most rewarding moments was taking all of this research and speaking and turning it into a tangible solution at work. We had a requirement come up in a project where we needed to do some trading partner integration using a RESTful API. As a result of all the ‘homework’ I was doing, I was able to spin up and API Management and supporting APIs all within two weeks that addressed a project requirement and gave the organization flexibility. We have had approximately 15 million calls to this API in the last 6 months which has been very rewarding. Another area of learning for me was around SaaS connectivity and more specifically ServiceNow. ServiceNow is an IT Service Management tool. This was a tool that our organization was implementing and was given some warning that some integration with this tool was bound to happen. Being in the MVP program has created many opportunities for me to speak all over the world. 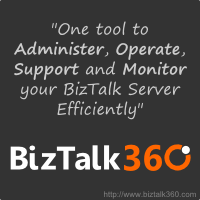 For that I am grateful to fellow MVPs, BizTalk360 and Microsoft for creating those opportunities. This year was another busy year speaking. I spent more time speaking in my home town (Calgary) than ever before which is encouraging to see as it shows there is more appetite for cloud integration. .Net Usergroup I was a last minute addition to the MVPs putting on an Azure Cloud day. In this session I was able to talk about Azure Service BUs messaging. For many in attendance they were familiar with MSMQ but never heard of Azure Service Bus. It is always fun to demo ServiceBus as people feel there is a little bit of magic whenever you start showing the Relay Service. #IntegrationMonday – The brainchild of Michael Stephenson and Saravana Kumar has brought together a world-wide Microsoft Integration community on a weekly basis. I had the opportunity to speak twice (link, link). Thanks Mike and Saravana for giving me the opportunity. 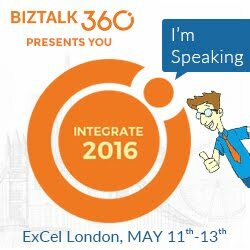 BizTalk Summit (London) – This was my second time speaking in London and have to thank Saravana and his team for the opportunity. This was probably the largest audiences that I have spoken in front of with more than 350 people in attendance. In my session I talked about an Introduction to Azure API Management. I think this is an untapped discipline amongst BizTalk resources so it was a good opportunity to introduce many people to the subject. Following this event my wife and I went to Portugal to visit Sandro and SteefJan. Sandro took great care of us and showed us all around his hometown of Porto. It was an amazing trip so thanks Sandro! BizTalk Booktcamp (Charlotte) – Mandi Ohlinger, from Microsoft, was hosting another edition of the BizTalk Bootcamp. I had the opportunity to speak at this event in 2013 and was happy to return. I had two sessions at this event. The first was a replay of my BizTalk Summit API Management session and my next session was a live Lab walkthrough. I had some tremendous feedback after this event. I had people who had never heard of API Management, provision their own API Management instance, manage a set of APIs, call it from Postman all within an hour. They could not believe how far they were able to go within 1 hour. While I appreciated the feedback, it is also a testament to that Azure API Management platform as well as it is a simple but powerful tool. MVPDays – I was approached by a local MVP Dave Kawula to speak at his upcoming MVPDays event in Calgary. It was more of a Cloud Infrastructure event, but I appreciated the opportunity to introduce API Management and SaaS connectivity to a new audiance. Azure Hybrid Integration Day – This time it was my turn to host some of my European MVP buddies and put on an event in Calgary. With the help and support of my Canadian MVP Lead Sim Chaudhry, support from Microsoft Canada employees such as Darren King and BizTalk360 we were able to pull of an entire day focused on Microsoft Integration. My session focused on Azure App Service and SaaS Connectivity using Microsoft’s latest bits. After the event was over we had the opportunity to take in a football game (with tailgate) and cheer for the Saskatchewan Roughriders (event though they lost). MVP Summit Videos – For the second straight year Microsoft arranged for Integration MVPs to enter the Channel 9 studios to record some short sessions. I want to thank Jon Fancey and Mark Mortimore for co-ordinating this. My session focused on some of my demos from the Azure Hybrid Integration Day. Around the August timeframe I had the opportunity to start writing for InfoQ. For those of you who are not familiar with InfoQ, it is an online media outlet that focuses on Technology News and also hosts many conferences called QCon. The organization is pretty impressive. They have assembled a distributed team of technologists who also have a passion for writing. Their goal is not necessarily to break news but to provide some technical substance to the happenings in the industry. I am part of Richard Seroter’s Cloud Editorial team. Richard and I co-authored a book several years ago and we continue to be good friends. Richard is also one of those people that I regularly say “how does he do it” as he always has a million things on the go and the quality never suffers. The opportunity to work along side him in this domain was too good to pass up and appreciate the opportunity he gave me. The best part about writing for InfoQ is all of the ‘forced learning’ that occurs. While I pride myself on staying up to date it can become difficult especially when you consider all of the platforms out there. As you probably know, I spend a lot of time in the Microsoft eco-system which is obviously one I enjoy. Previously I was not very focused on what some of the big cloud players like Amazon, Salesforce and Google were up to. As a result of covering these companies I now have a new perspective about what these companies are doing right and where Microsoft may have room for improvement. Ultimately, I think this helps me do my day job better as I have a good appreciation of where the industry is headed. Since September, I have had the opportunity to write approximately 17 articles. I figured it would be fun to list my 5 favourite articles (in no particular order). Salesforce Enters IOT Platform- This provided me with one of those ‘ah ha’ moments. I think Salesforce is onto something with this platform. If you think about tying customer events into a customer engagement platform, I think Salesforce will have a lot of opportunities in this space. PowerApps – I was sitting beside Richard at the MVP Summit where the team is talking about PowerApps. Richard gave me a nudge and said – “hey you should break this story when it is no longer NDA”. After the session I reached out to Wade Wagner from the product group who put me in touch with some marketing folks at Microsoft who ensured I had all of the information I required in order to launch a detailed article as soon as the embargo was lifted. It was neat to be part of launching a story like this. Microsoft’s Integration Roadmap – While I did write about this on my blog, I was deliberate to provide my personal opinions on the matter. The goal of the InfoQ article was to remain objective and speak to the facts. Regardless, It was fun to write about this topic from that perspective and in that outlet. Amazon IOT Beta– Once again, having not been familiar with what Amazon was doing with IOT, this gave me the opportunity to compare and contrast Amazon’s vision against Salesforce and Microsoft. Event Hubs surpasses 1 Trillion messages in a month – This was my very first article and also gave me an opporunity to interview Dan Rosanova. You can always get a good sound bite out of Dan. It was really neat to see where Dan, Clemens and ther rest of the team have been able to take this service. 2016 should be another very interesting year in the area of Microsoft Integration. We will see a new version of BizTalk Server, Logic Apps Updates, PowerApps Updates and also another Integrate event in Q2. It is also off to a good start with my MVP being renewed. All Integration MVPs have been moved into the Azure discipline. I believe this is my 9th year in the program. I know someday it will end but until that time I am happy to continue to contribute to this excellent community.